Check out our Catering Menu for your next event! 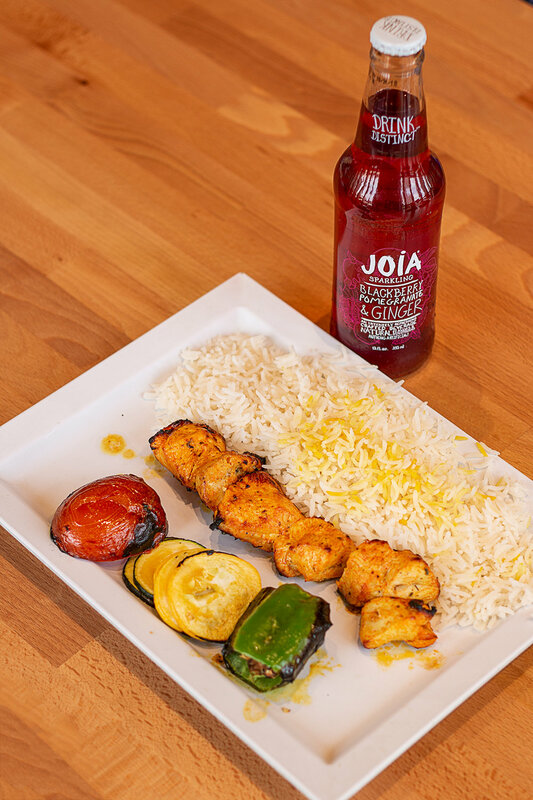 Veggie, Koobideh, Chicken Filet, Shish Kabob (+2.00), Halal Lamb (+4.00). Veggie, Koobideh, Chicken Filet, Shish Kabob (+2.00), Halal Lamb (+4.00), Salmon (+5.00). Marinated Zucchini, Squash, Tomato, and Green Chile grilled perfectly over an open flame. Perfectly marinated Salmon, grilled perfectly over an open flame. 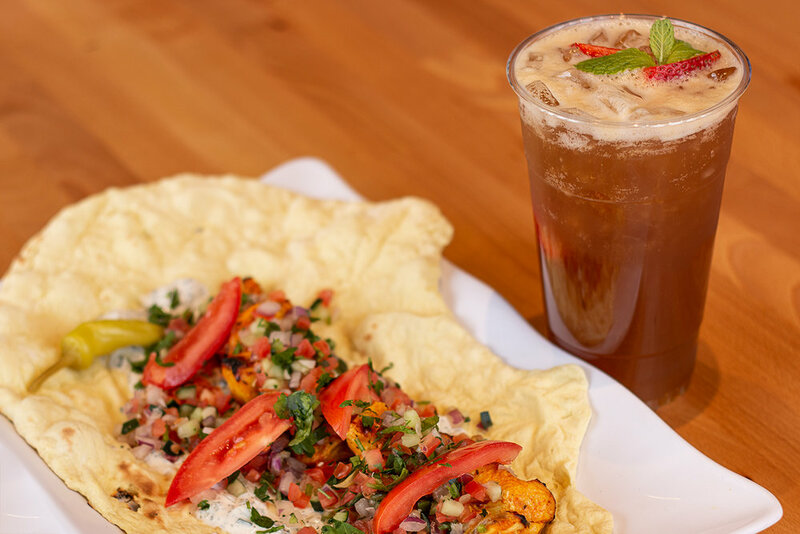 Freshly baked Naan topped with tomatoes and parsley, with a cucumber and yogurt spread (mast o khiar), shirazi salad and a pepperoncini on the side. Gheimeh (Split Pea & Tomato) - Ask about our Vegan option. Persian Green Stew (Ghormeh Sabzi) - Ask about our Vegan option. Pomegranate & Walnut Stew (Fesenjan) - Ask about our Vegan option. *Some stews are available as vegetarian or with meat. A stew can be substituted in place of a meat-kabob in a Chello Combo meal when available, or as a side for a smaller portion. Salad served with Feta Cheese, Kalamata Olives, Lettuce, Mediterranean Dressing, Pepperchini, Tomato Wedges. Half salad served with Feta Cheese, Kalamata Olives, Lettuce, Mediterranean Dressing, Pepperchini, Tomato Wedges. Served with feta, oregano, parsley, dill & olive oil and a wedge of lemon. Our small, chopped, Mediterranean style, side salad made with cucumber, tomato and onion. A savory yogurt with Green Chile dish great for mixing with your rice or dipping your bread. A savory yogurt with Cucumber dish great for mixing with your rice or dipping your bread. A 16oz container of your choice of side. or have a Nut Roll made from walnuts and cinnamon rolled up in a flaky crust and drizzled with chocolate. Chello means rice in Farsi. Make your own Chello at home with this 4 cup rice cooker. Chello means rice in Farsi. Make your own Chello at home with this 10 cup rice cooker. All of our Veggie-Friendly Options in One Place! Our tasty open-faced Falafel served with lettuce, tomato on freshly baked Naan, with a cucumber and yogurt spread and pepperoncini on the side. Regular 2.99 Large 5.99, Ask to remove the meat to make it Vegetarian! Gheimeh (Split Pea & Tomato Stew) - Ask about our Vegan option. Adasi is another healthy and delicious Iranian dish. It’s a combination of Lentil, Butter, Fresh Squeezed Lemon and Ground Angelica that gives this simple dish layers of flavor. A 16 oz container of one of our stews. A smaller plate designed with kids in mind. It comes with a veggie skewer and rice. Gheimeh - Ask about our Vegan option.